This hearty vegan soup is fabulous comfort food for a cold winter day. It’s packed with flavor and texture. 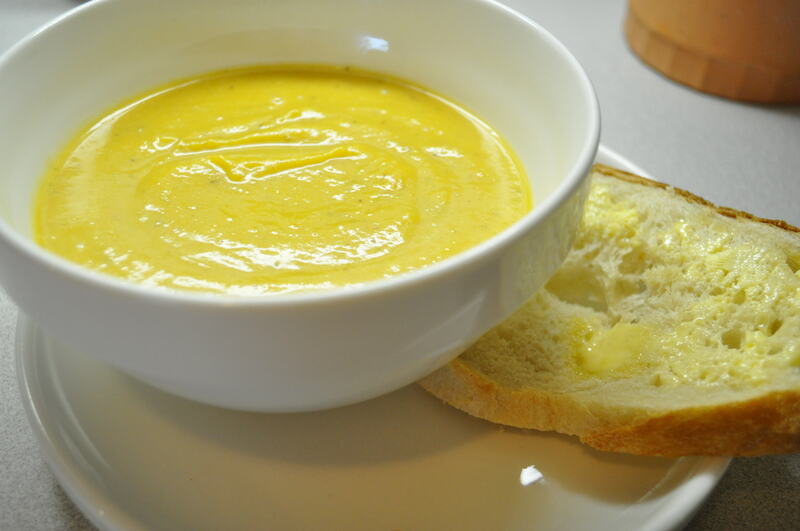 If you’re not vegan, don’t worry…you’ll fall in love with this soup! Eat this for dinner, or for lunch. It reheats well and stays good for a week in the fridge. In a large stockpot, heat oil over medium-hight heat. Add onions and cook until brown, about 10 minutes. Add mushrooms and cook for another 5-10 minutes, until they are tender. Add celery root through wine. Bring to boil. Add barley. Return to a boil, and reduce heat. Simmer, covered for 45 minutes to 1 hour, stirring occasionally. Stir in both vinegars and season with salt and pepper to taste. Combine 1 tbsp oil with cubed butternut squash, thyme and rosemary in a 9×13″ baking dish. Bake uncovered for 45 minutes, stirring every 15 minutes, or until golden brown. Meanwhile, in a large stockpot saute onions and garlic in 2 tbsp oil over medium-high heat. If the garlic begins to stick, add 1/4 cup chicken (or vegetable) broth. Continue to cook for about 10 minutes, until onions are translucent and evenly browned. Set aside. When the butternut squash is done, add roasted butternut squash to onion mixture in stock pot. Add remaining chicken (or vegetable) broth and water. Bring to a boil, and simmer for about 10 minutes. Add skim milk and half-and-half. Stir well. Then add balsamic cream vinegar. Remove from heat. Using a food processor or blender, blend in batches until smooth. Season with freshly ground salt and pepper. This recipe is from the Moosewood Restaurant New Classics Cookbook. 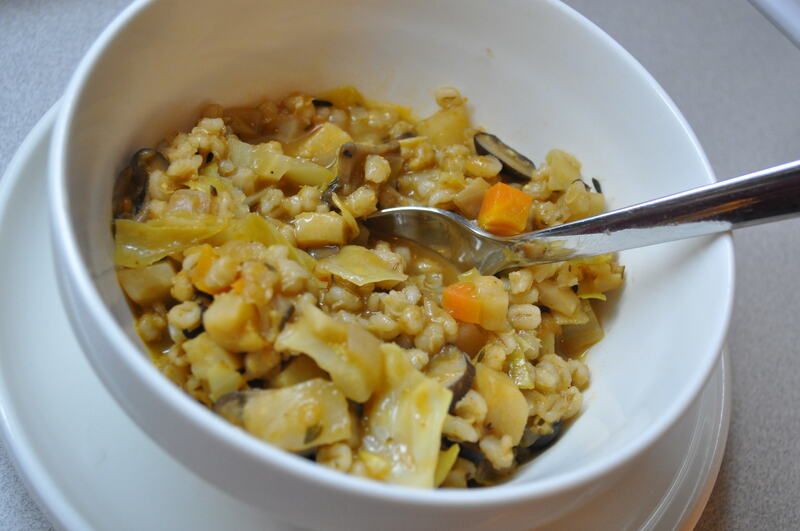 Serve with Fall Vegetable Stew. Preheat oven to 425 degrees F. Lightly oil baking sheet. Place the butter pieces and lemon peel in a medium bowl or in a food processor. Sift the flour, sugar, baking powder, baking soda, and salt over butter. By hand or with the food processor, mix the butter into the flour until evenly distributed. Add the thyme and mix well. Add the buttermilk and stir or pulse briefly. The dough will be soft and a little sticky. On a lightly floured surface, pat the dough into a 9-inch circle that is about 1/2 inch thick. Slice into six pie-shaped wedges. Place the wedges on a the prepared baking sheet. Bake for 20 minutes, until the biscuits are firm and golden brown.